Remember the cheap greenhouse we put up to cover the aquaponics? I thought an update was in order. The 1500 gallon fish tank seems to keep the temp in the greenhouse from getting down to freezing. 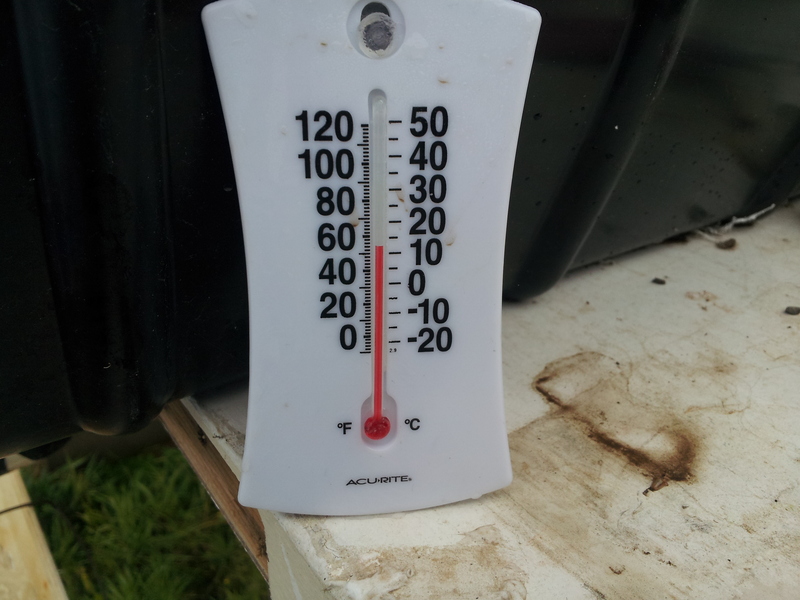 The wife got some thermometers and stuck one inside the greenhouse, out of the light, and one in the shade outside. I think the low that morning was 35 degrees, but it’s 40 degrees here at 10am. Just a touch under 55 degrees. That’s a really good sign. Usually the temperature in a greenhouse lags in the morning. 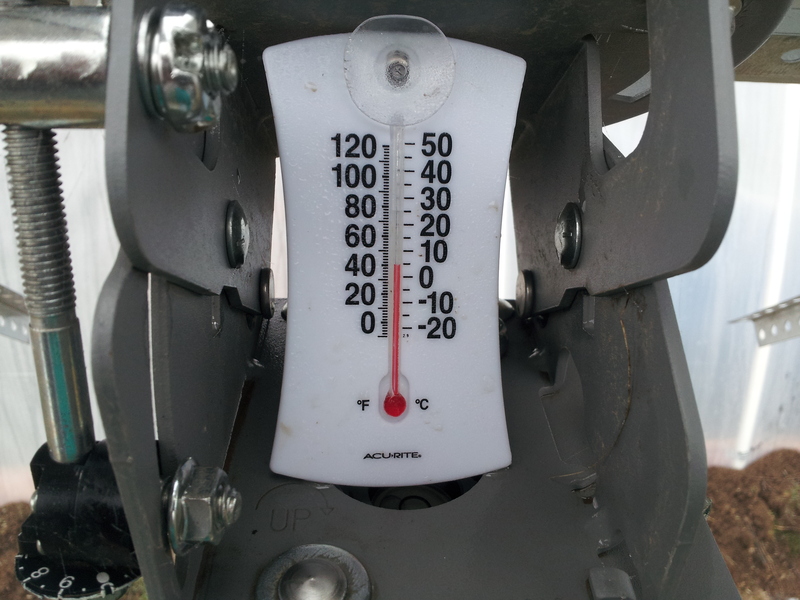 I have no illusions that the greenhouse will stay above freezing when it gets to be 20 degrees outside. What would you use to bump the temp up? I’m not really worried about the freezing temps as long as the pump keeps running. I imagine the cold will start catching up with the batteries though. This entry was posted in Buildings/Structures and tagged greenhouse, heat by admin. Bookmark the permalink. The best way to keep the green house warm is to keep the water warm. You will not be able to do it with the electrical you have. To heat, or maintain water temp requires 1 btu per lb of water – water weighs 8.3 lbs per gallon, (the definition of a British Thermal Unit is the amount of heat required to raise one lb of water 1 degree Fahrenheit) you will need to know what water temp necessary for whatever fish you choose to keep, from there calculations can begin. There are small propane camping type water heaters in conjunction with a pump could do the job for a reasonable cost and some design ingenuity. In any case it’s going to cost some $$ to keep it working all winter. If you need help with the calculations for the thermodynamic or solar electric part of your project feel free to email me. Thanks, Nicko! I’ve been considering a passive solar water heater. The issue with it is that I’d have to rig a valve to shut off when there isn’t light/open when there is. I’ve also never built one before, so I don’t know how effective they are.